The RRC/RRB Group D Previous Old Question Papers are available here. In this section, you will get the last 10 years Examination Papers. 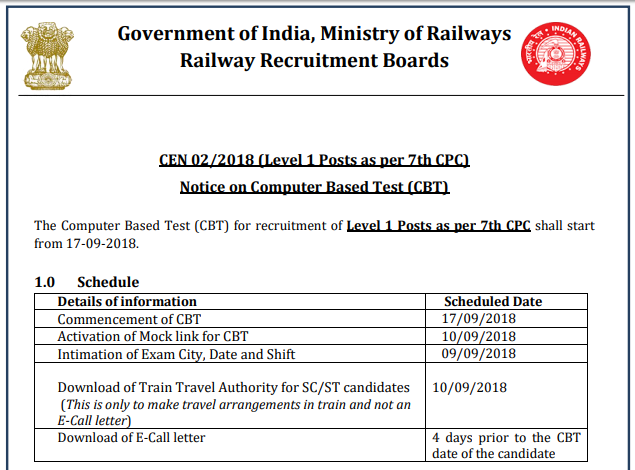 The RRB is going to conduct an exam for RRB Group “D”. This year, the Recruitment Board is inviting around 26, 502 vacancies. The Previous Year Question Papers are solved with simple solutions. You can download RRB/RRC Group D Question Papers for Free. We have also provided Model Test Papers for RRB Group “D” so that the candidates can get an idea about the Exam Pattern, Sections, Marking Schemes etc. This website will give you not only the latest details about the Group-D Post Notifications but also provide you with the latest question papers as well as previous question papers along with the solutions. For the candidates easy understanding, we have provided easy solutions of the questions along with shortcut tricks. And the best part of it, is you can get all of this for free. You don’t have to pay for it. We also provide different model test papers which can be quite beneficial for the candidates who are appearing for the Group “D” Exams. Though this practice papers and model test papers the candidates can get a particular idea of how to prepare for the exams so that they can score with good cut-off. The question papers will be available in the PDF Format, which can be easy to download. The exam that will be conducted will be an online test which means Computer Based Test. The test follows objective type multiple questions. The Examination is divided into four sections: Arithmetic Ability, General Science, Reasoning and General Knowledge. The total marks of the Examination is 100 marks. The total time duration of the Examination is 90 minutes. There is a negative marking, 1/3rd marks will be deducted for every wrong answer. The standard of the questions will be basic 10th standard level. Mathematics: Number System, BODMAS, Decimals, Fractions, HCF, LCM, Ratio and Proportion, Percentages, Mensuration, Time and Work, Time and Distance, Simple and Compound Interest, Profit and Loss, Algebra, Geometry and Trigonometry, Elementary Statistics, Square root, age calculations, calender and clocks, pipes and cisterns etc. General Intelligence and Reasoning: Analogies, Alphabetical, Number series, Coding and Decoding, Mathematical Operations, Relationships, Syllogism, Jumbling, Venn Diagram, Data Interpretation and Sufficiency and conclusions and decision making, similarities and differences, analytical reasoning, classifications, directions, statements- arguments and assumptions etc. General Science: In this section, it covers all the topics of the subjects Physics, Chemistry and Life Sciences of 10th standard level. General Awareness on Current Affairs: In Science and Technology, Sports, Culture, Personalities, Economics, Politics and any other subjects of importance. The admit card of RRB Group-D Exam 2018 will be uploaded soon on the regional websites of RRB. The candidates have to download the admit cards soon after it is uploaded. To download the Admit card for Group “D” Posts, you need to have your application details kept ready. You can also download the admit card by submitting Registration Number/Roll Number and Date of Birth. The presence of the Admit card is a must during the examination. No candidates will be allowed to appear the examination without an Admit card. AND CLICK ON “Forgot Registration Number?”. THEN IT WILL ASK YOU FOR “DOB” AND “E-Mail-Id”. ENTER THEM CLICK ON “SUBMIT”. YOU WILL GET REG.ID. Computer me exame hoga to math ko raph kiye bina solve kaise krenge sir ?? RRB Group d Tamil model question papers. Sir group D examition me hindi question paper hoti he kya ? group d que paper send karo..
it’s not motel. it is model question papers. Sir group d me kaisa question aata hai?